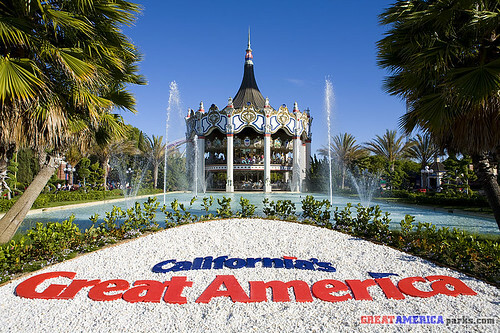 New for 2009 at California’s Great America: no new wooden roller coaster! — courtesy of the park’s friendly neighbor. Watch for a status update in our next issue. We will know more about the fate of the new wooden roller coaster project following the city council meeting later this month. Meanwhile, the park is focusing on new entertainment in 2009. Headlining the new offerings will be All Wheels Extreme, a stunt show featuring amazing feats by BMX riders, rollerbladers, skate boarders, and more. This new show opens in June in the Redwood Amphitheater. The new entertainment lineup continues with comedic magician Chipper Lowell in The Chipper Lowell Experience at the Showtime Theater in Orleans Place. There will also be more fireworks in August, a bigger and scarier Halloween Haunt, as well as concerts, special events and more. Also new for 2009 will be a new and improved Grizzly. For a report, check out: Grizzly rehab.